I am excited to be collaborating today with Lilla Rose for an awesome giveaway! Independent Consultant, Rebekah Behrens, is giving away a flexi clip or any Lilla Rose item to three, yes 3, winners! The flexi hair clip is a great accessory for adding a bit of glamour to your everyday hairstyle. They are easy to use and super convenient for pinning hair out of the way; perfect for that busy mom! It is beautiful, unique, and well-made. It is also very comfortable, and you can say goodbye to the ponytail headache! Another great thing about the flexi-clip is that it works in all types of hair, from baby-fine to super-thick so you can do your hair beautifully in seconds and be ready for the day! Be sure and watch the sizing and styling videos so you can learn which size clip will work best for you! Right now, if you make a purchase, during the giveaway period, all NEW customers will receive a FREE flexi when they spend $40 or more! *Place an order of $40 or more (excluding tax and shipping), then message her to redeem your free surprise flexi! Offer valid for U.S. customers only and expires March 6, 2015. Be sure to check them out on Facebook and Pinterest! Now for the giveaway! Giveaway is open to U.S. Shipping addresses only. They’re all so pretty! But I love the sea turtle flexi clip. I think I’d pick the Tiger Lily clip in small, but I keep changing my mind! I like the flexi small princess tiara dangle! I have seen these, but haven’t made the plunge and bought any. They look amazing, though. Um, yeah…I need a dozen of these right now. Haha Stephanie! I can totally relate, that’s how I got started with Lilla Rose, I wanted ALL of them! Stephanie, It’s funny you say that. One day my girls decided to see how many clips they could put in one of my daughter’s hair – we didn’t count them but it was DOZENS – we put it on Instagram @to_do_good_things you can miss it – it looks like an Egyptian headdress – so funny! I love all of them, but I lean towards the open gold flower. The medium princess tiara flexi clip. Thanks for entering Melanie! Good luck! Anne Marie – that’s funny – girls with curly hair love the flexi clips because they just don’t pull your hair like elastics or hair ties – they just don’t get caught up, but they will still hold it securely. YAY! Thanks for entering. I think the one you are wearing is very pretty! I also like the vintage hearts flexi clip! I love your clip, it’s so pretty! I like the Lovely Circle Iris Green. Thank you! I love owls, so the Night Owl flexi would be great for me. Loren – the owl is very popular for us – the mini clip is probably my favorite of the owl because it’s so cute and tiny! The fairy is super sweet LaTanya – thanks for entering! I like the chopsticks and the flexi clips. Angela – if you like sticks – check out the you pins – the concept is similar, but I LOVE the style of them even more than the sticks. Elegant Ornate! Thanks for the chance! that would look GORGEOUS in your red hair! Actually, any of our clips in red hair looks amazing – for a while all I collected were pictures of clips in red hair and then I thought – sheesh – some people might actually like to see what the clips look like in other colors of hair as well. LOL Thanks for entering! Audrey – you have a very classic taste in clips which really goes with your classic name! I LOVE Flitter – the matching hairband is my favorite of the hairbands – something about green and gold together – SO pretty. I’m also jumping on this gold and green bandwagon…really one of my favorite combinations! Victoria – the green is beautiful and the size number you picked is the Mega – it’s REALLY, REALLY big – I have some fun pics on facebook of how much hair those will hold. I like the Roman Cross Antique Brass Clip! That one is a super different color – very neutral but neither gold nor silver – it’s a nice different muted metal. Anna – the owl is super sweet – it’s really adorable in the size mini! April – this might become a new best seller after Melissa’s gorgeous styling! I like the floral design with the black stones! Our black clips are great for an understated look, though they really stand out in light hair. Thanks for entering Paige! I like the large lovely circle emerald flexi clip! The emerald clip is probably one of my most requested clips. It’s a lovely choice Priscilla! 3-1044 Open Heart This one is so elegant and feminine-a MUST have!! I have a pixie style haircut so I love the bobby pins, they would work best with my hair! Yes, the bobby pins would be super cute. Did you check out the hair bands? I LOVE the way they look with pixie cuts. Tiger Lily is a great choice Laura! Thanks for entering. Ashley – Aren’t those bobby pins gorgeous? I have a beautiful picture of a girl with them on my instagram account – they look amazing in her raven hair. Great choice! I really like the butterfly flexi. Hey Lisa – Yes, the butterfly is sweet – we actually have two different butterflies in the size mini – both in pink and the purple. Thanks for entering! I love the Open Flower Gold flexi clip. So very pretty. 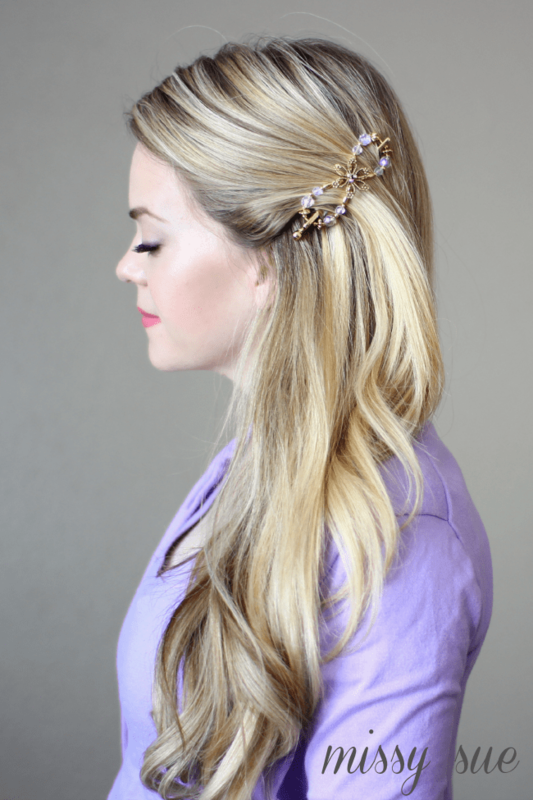 I think this clip might become a new top seller thanks to Melissa’s gorgeous styling with it! Thanks for entering. I always tend to put small piece of hair up on one side. I am really interested in seeing if these would work. They would look so cute. I tend to have a problem with things slipping out. Hi Jillian – the size mini would be perfect for sweeping a side back and YES they really do hold in fine hair. I made a little tutorial with my toddler – it’s pinned on my pinterest board, but I show how best to put it in very fine hair – I should probably make another one showing the modifications for adults…. hmm maybe this afternoon – and the Lovely Circle AB is GORGEOUS – just LOVE that little clip. Hi Sean – LOVE the Soaring Butterfly – that’s definitely a top seller for me. Thanks for entering! I’d get the 1-0379 Tiger Lily. It’s so pretty! Hi Alina – The Tiger Lily is a great choice – it can go with so many different outfits and really pops in dark hair! Thanks for entering. Jess – your hair looks long – check out the matching You pins for the ruby bouquet – LOVE them! Thanks for entering! Wow! Those are impressive little pins right there! I like the extra small clip in the simple drop! Jeanette – Great choice! The simple drop just adds a tiny bit of sparkle to your hair – so pretty. Thanks for entering! Melissa – Gorgeous! You are so talented and make our clips look even MORE beautiful with your lovely styling! Love love love your tutorials, and I’d love to try a flexi clip! Megan – Doesn’t Melissa do the BEST tutorials! That’s one of the reasons I was So excited to work with her on this giveaway! Good Luck!! The tree of life in gold is a fairly new design and it’s gorgeous – we have a pearl hairband that you can pair with it and it looks super cute! Ally – Aren’t the badge holders cute? They are a great way to show a little personality for something that is usually pretty plain. Rae – the sizing video is SUPER helpful for choosing the right size for the styles you want to use the clips for, I’m also happy to help! Feel free to message me – we also have a size exchange guarantee that ships free both ways! I lobe the one you are wearing in the pictures. My second choiche would be something silver. Suzanne – we have lots of choices in silver – the celtic knot is our best seller, but we also have the clip that Melissa is using in silver with black beads! Really? I didn’t see that one. I did see a silver one with lots of colors. It seems gave me an instant summerfeeling. Love it! I LOVE this daisy one for reminding me of spring. The clip that you’re using is so beautiful!